The Language Arts Courses of Study are based on the Ohio Academic Content Standards. These standards represent a research-based approach to literacy development, promote writing as a process and provide expectations for students to become effective communicators. Standard: An overarching goal or theme in language arts. The standard statement describes, in broad terms, what students should know and be able to do as a result of the K-12 program. Scott Foresman Reading Street © 2008 is an all-new reading program for Grades K-4 at Cornerstone, Grill and Primary Elementaries. 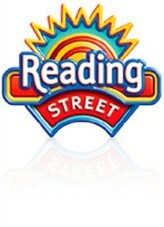 Reading Street is designed to help teachers build readers through motivating and engaging literature, scientifically research-based instruction, and a wealth of reliable teaching tools. The program takes the guesswork out of differentiating instruction with a strong emphasis on ongoing progress-monitoring and an explicit plan to help with managing small groups of students. In addition, Reading Street prioritizes skill instruction at each grade level, so teachers can be assured they will focus on the right skill, at the right time, and for every student. Please click on the tour link to see some of the features that Reading Street will offer our students.